Some custom orders are especially nice to do when you know just how much they are going to be appreciated. This order was one of them! 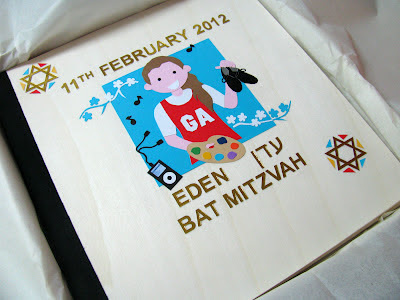 The young lady who was celebrating her Bat Mitzvah has been part of my life pretty much since she was born. Her Mum is a good friend of mine, and her daughter has often received birthday cards of mine and has very sweetly told me many times how much she likes my work. When her Mum asked me to make an album for her daughter's Bat Mitzvah I knew that a lot of care and consideration had to go into it - of course, as it always does - because I knew the young lady was going to treasure it. Eden, the Bat Mitzvah girl, had a definite idea how her album was to look, though Mum did give me freedom to play around with her ideas! I was asked to show her with her beautiful long hair in a ponytail, wearing a red netball bib with the letters GA (Goal Attack) on it. Eden is a creative girl and requested that I show her holding a paint palette in one hand and a pair of black jazz dance shoes in the other hand. We initially talked about her wearing earphones, to represent her love of music, but then opted for an iPod instead. 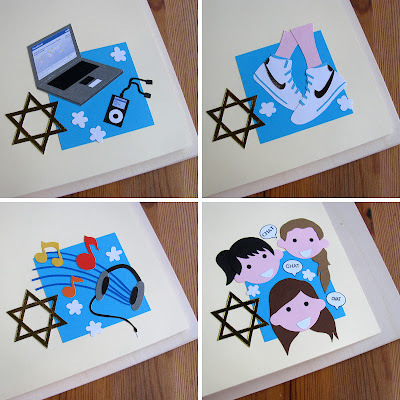 The beautiful invitation I had received for her Bat Mitzvah party was turquoise and white. To continue with the colour scheme, I picked out the floral design from the invitation and made my own turquoise and white version of it for the album cover. 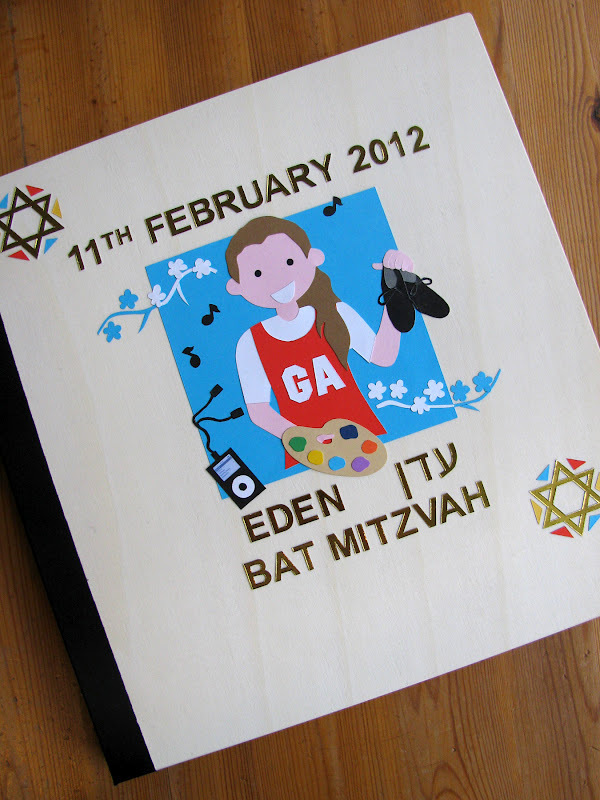 The date of her Bat Mitzvah ceremony in the synagogue, plus her name in both English and Hebrew complete the cover design. Inside the album I decorated several pages to illustrate Eden's various hobbies and interests (below). The first page shows her laptop computer with Facebook open on the screen (funny how I seem to do that on so many of the kids' albums these days!) and the iPod once again. As well as being a keen jazz dancer, Eden also loves hip hop, so her fancy blue and white ankle high trainers had to be featured too. Her Mum asked me to somehow illustrate her daughter's love of music as well. She mentioned the possibility of me illustrating a cassette tape but I figured that I am perhaps the only person who listens to cassettes these days! Instead I crafted some music notes and headphones, along with those same white flowers from the cover. The last page featured a group of chatting girls. I guess there's no need for an explanations for that one! Eden seemed absolutely delighted with her album and told me many times over the course of the celebrations how thrilled she was with it! 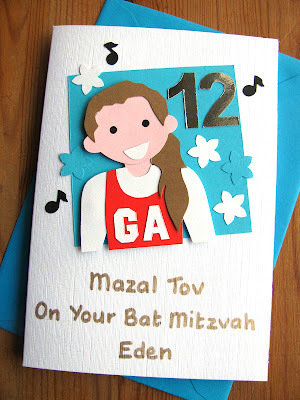 Since I was to be a guest at her Bat Mitzvah party it seemed only right that she should receive a matching card from me. 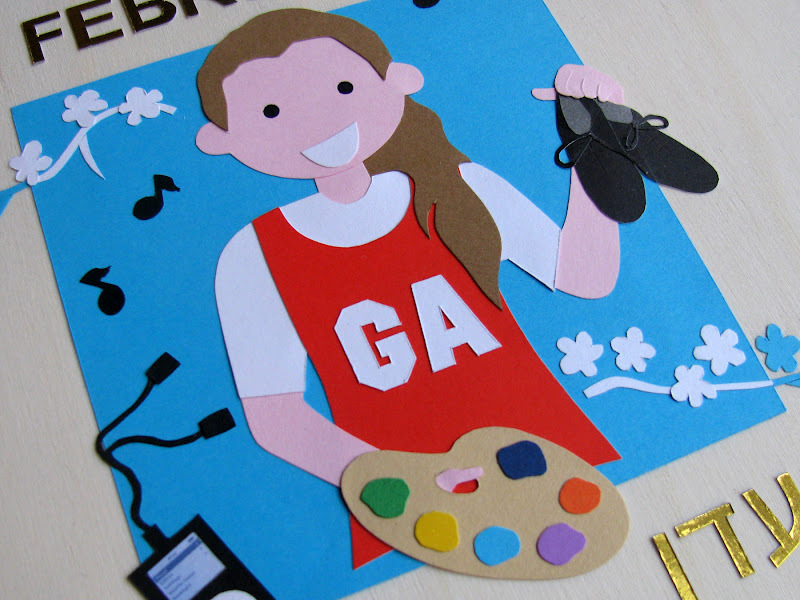 Once again I created a paper version of the young lady wearing her netball bib. She is surrounded by a few music notes and flowers, similar to those on her invitation. 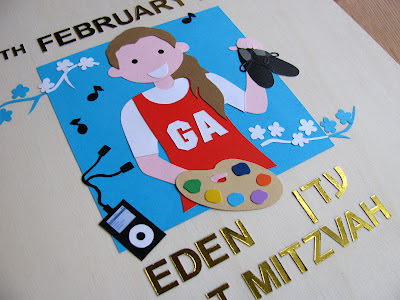 It was wonderful to be able to celebrate this young lady's Bat Mitzvah and even more so, to be able to make something for her that I know she is going to treasure. I don't often know the kids whom I make the albums for. This was a request very close to home and one that was truly a pleasure to create. Mazal Tov Eden! I'm sure she liked the album. Great piece of work. Eden's book is adorable! Great work! I love how customized it is. Very pretty!! Love the painting pallette and the iPod! Nice elements! Very nice and colorful! !